Must be your lucky day today, you will be happy to know you are getting all 5 pairs with your order! It's Vintage Diamond pattern makes them desirable and it's colorful combination make them fascinating... It is interesting to know the fact that they are cool and comfy to wear and you will get so used to them, that it will feel like having your safety blanket with you whenever you put them on... These no-show style ankle length socks are fashionable too and so pretty that you would love to show them off! They are knitted with 78% combed Cotton. Fashionable and Most comfortable to wear while you lounge. They are ankle length, great as a no show socks that you actually would love to show off. These unisex socks are stretchable and they fit Women sizes 6 to 11 and Men sizes 5 to 11. 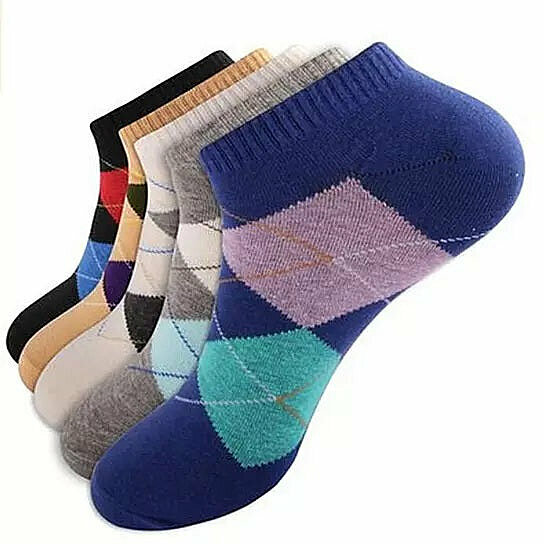 They come with a Diamond pattern in a combination of colors like BLACK, YELLOW, WHITE, CHARCOAL AND BLUE, you get all 5 pairs with each order.